A volunteer waits outside the international arrivals terminal at Seattle-Tacoma International Airport offering legal assistance, March 5, 2017. Volunteers have offered help to international travelers since the original travel ban was announced. U.S. President Donald Trump signed a new executive order Monday, barring travelers from six countries to the United States for three months, and all refugees for four months, after federal appeals judges blocked a similar order last month. The new ban includes a grace period and will take effect on March 16. It will not affect legal permanent residents — those with green cards — or travelers who already had valid visas as of Jan. 27, 2017. "This executive order is a vital measure for strengthening our national security," Secretary of State Rex Tillerson said at press conference announcing the new ban. "It is the president's solemn duty to protect the American people." The rollout of the new security measures amounts to an acknowledgement by the Trump administration that its original travel ban, issued January 27, was flawed. But critics immediately assailed the new order as merely making "cosmetic changes" to the original ban and argued that it still creates a religious test for entering the United States and will therefore not stand up to judicial scrutiny. In an attempt to ensure a smoother rollout of the travel ban and protect it from legal scrutiny, the new executive order differs from the old version in several key aspects. Monday’s order also removes a provision indefinitely barring Syrian refugees from the U.S. Also removed is language giving preference to "religious minorities," a provision that had been widely seen as an attempt to follow through on Trump's promise to prioritize Christian refugees. FILE - President Trump signs the original executive order for a U.S. travel ban at the Pentagon in Washington, Jan. 27, 2017. Iraq was removed from the list after officials there promised increased cooperation with U.S. officials regarding the vetting process, according to a senior official with the Department of Homeland Security (DHS), who spoke to reporters on a conference call. Baghdad, a key ally in the U.S. fight against Islamic State militants, had complained when Iraq was included in the original travel ban. "The close cooperative relationship between the United States and the democratically-elected Iraqi government, the strong U.S. diplomatic presence in Iraq, the significant presence of U.S. forces in Iraq, and Iraq's commitment to combat ISIS justify different treatment," said a Q&A sheet distributed by the Trump administration. ISIS is an acronym for Islamic State. Critics of the original order questioned whether the seven countries affected — all majority-Muslim — were targeted for religious reasons. The DHS official on Monday again denied those accusations, saying: "This is not a Muslim ban in any way, shape or form." White House officials also stressed the temporary nature of the order, but suggested that the travel ban may be expanded after the 90 days expire and that other countries could be added to the list. People gather to protest President Trump's new travel ban order in Lafayette Park outside the White House, March 6, 2017. Even with the changes, the bill is still likely to face legal challenges by groups that view the order as a partial fulfillment of Trump's campaign call for a "total and complete shutdown of Muslims entering the United States." "Nothing substantive has changed," said Lavinia Limon, who heads the U.S. Committee for Refugees and Immigrants (USCRI). "It's around the edges, right? If this had come out a month ago, we would be outraged." The American Civil Liberties Union, or ACLU, which filed successful legal challenges against the original order, also said the revised ban "has the same fatal flaws" as the original. "These are again, simply cosmetic changes," said Ed Yohnka, the ACLU's Director of Communications and Public Policy. "This is still unconstitutional, this remains a religious test to enter the United States of America. This is something fundamentally that our nation has never permitted. And we will not permit it again." "The only way to actually fix the Muslim ban is not to have a Muslim ban. Instead, President Trump has recommitted himself to religious discrimination, and he can expect continued disapproval from both the courts and the people," said Omar Jadwat, director of the ACLU's Immigrant Rights Project. "What's more, the changes the Trump administration has made, and everything we've learned since the original ban rolled out, completely undermine the bogus national security justifications the president has tried to hide behind and only strengthen the case against his unconstitutional executive orders." Administration officials, meanwhile, were walking a fine line between insisting the new order was different enough from the old measure to withstand legal challenges but similar enough so that it would still be effective. "The principles of the executive order remain the same," said White House press secretary Sean Spicer, adding, "We continue to maintain the [original travel ban] order was fully lawful." The Trump administration leans heavily on the rationale that refugees, as well as immigrants and travelers from certain countries, are a security risk to the United States; however, it has proffered little evidence of that risk. White House officials on Monday released a memorandum saying that the FBI is carrying out "terrorism-related investigations" into approximately 300 individuals across the U.S. who were admitted as refugees. It is not clear whether those being investigated came from the list of banned countries, or how many have been charged with a crime. When pushed for details, the senior DHS official declined further comment, saying only that the 300 people were being investigated for "potential terrorism-related activities" and that it was "truly an alarming number from all our perspectives." Filippo Grandi, who heads the U.N.'s refugee agency, said the U.S. has long been a partner in finding solutions for refugees, but expressed concern about how the order will affect those fleeing violence and persecution. "The imperative remains to provide protection from people fleeing deadly violence, and we are concerned that this decision, though temporary, may compound the anguish for those it affects," Grandi said. Administration officials are promising a smoother rollout this time, insisting the White House has cooperated with DHS, the State Department, and the Justice Department on drafting and implementing the new executive order. "We're going to have a very smooth implementation period," the senior DHS officials told reporters in a press call, adding that there will not be any "chaos, or alleged chaos" at airports. The original order was announced early on the evening of Jan. 27 — a Friday right when most federal employees were finishing their first full week of work under the new administration — creating confusion at international airports across the country. Travelers from the seven countries — including legal permanent residents of the United States — were detained by U.S. Customs and Border Protection agents. Law enforcement didn’t know what to do with the refugees mid-flight when the order came down that banned them, as well. Still others were turned away at airports abroad, denied by airline officials who questioned the validity of their already-issued visas. DHS Secretary John Kelly, who was confirmed by the Senate a week before the original executive order was issued, shouldered the blame for the bungled implementation of the original order. "The thinking was to get it out quick so that potentially people that might be coming here to harm us would not take advantage of some period of time they could jump on an airplane and get here," he testified at a hearing of the House Homeland Security Committee on Feb. 7. More than a dozen lawsuits were filed across the country challenging the January order. Federal appeals court judges ruled in February to suspend the order in support of the "free flow of travel," as well as "in avoiding separation of families, and in freedom from discrimination." FILE - Kay Aull, from left, holds a sign and chants with Beth Kohn, Paul Paz y Mino and Karen Shore outside of the 9th U.S. 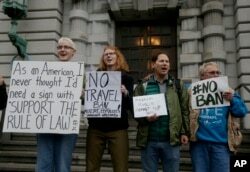 Circuit Court of Appeals in San Francisco, Calif.
Trump’s travel restrictions have not received broad public support. A poll released in late February by Pew Research Center showed that 59 percent of those surveyed opposed the ban, while 38 percent approved. A CNN poll released Monday suggested that 55 percent of Americans disapprove of the way Trump has handled immigration issues, compared to 44 percent who approve. On national security issues, Americans were split, the poll found, with 50 percent approving and 49 percent disapproving.